Regardless of personal thoughts and sympathies towards notches, punch-holes, foldable panels or any of the other current solutions to expanding mobile phone screen real estate, we are undoubtedly amidst a rather cool and way overdue smartphone design “renaissance”. But even though shiny new devices, like the Samsung Galaxy A80 might embody the experimental design spirit, they still rely heavily on the preferred “glass sandwich” styling of the day and thus require a certain level of care and protection to stay “mint”. Understandably, designing cases for these devices is a whole new and exciting challenge in itself. A difficult and potentially costly one, as made clear by the official Galaxy Fold case and its exuberant $120 price tag. But, pricing is subjective and will definitely follow a steep downward trajectory over time. The really interesting bit, at least for mobile geeks like ourselves, is exploring the actual case designs. 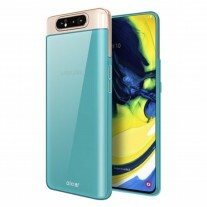 That’s why we decided to take a look at a couple of early options reputable case manufacturer Olixar has already put out for the Galaxy A80 and its extending , rotating middle-frame camera mechanism. First up is the Slim Genuine Leather Wallet case. This one seems to take a rather liberal approach to the concept of a case. 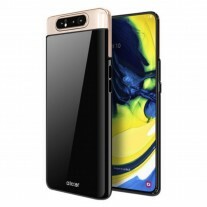 It is comprised of a rear segment, extending to the edge of the camera module and using some sort of adhesive surface to attach to the phone. 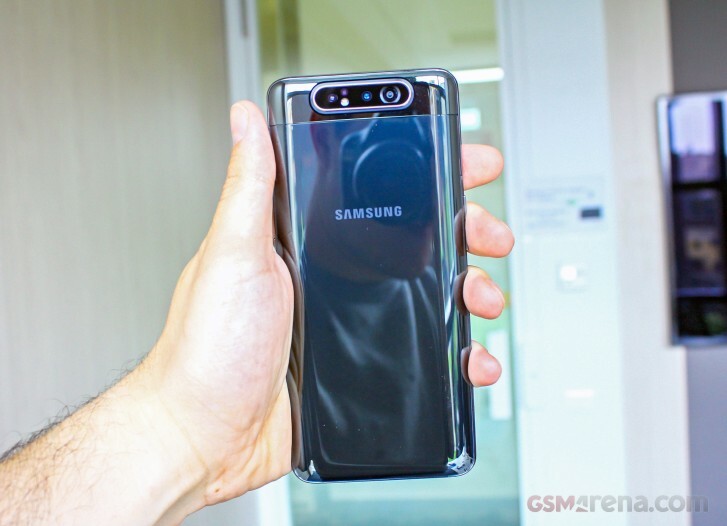 That’s necessitated by the fact that the sides of the Galaxy A80 remain pretty much uncovered, except for a patch of material underneath the volume buttons. 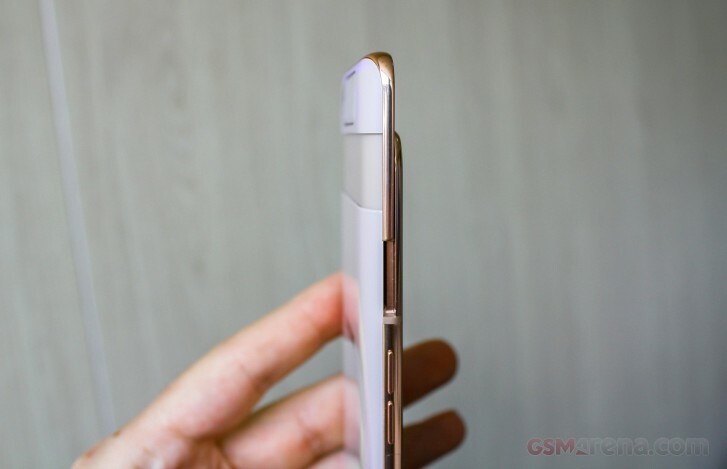 It acts as a hinge for the from segment of the case, which flips on top of the front glass. At least the display is fully protected. The Slim Genuine Leather Wallet case arguably looks very slick and stylish. Olixar’s website currently lists a black and tan variant, going for $21.99. Then there is the FlexiShield Gel Case which appears to offer a bit more protection. 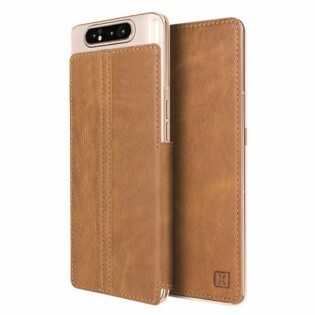 Much like a traditional soft case it grabs on the the sides of the phone and covers them, providing a “lip” that puts some air between the screen and any flat surface. It is interesting to note that Olixar managed to cut the back part of the case off around the elevating camera, while still maintaining a thin strip of it around the static part of the top frame. The FlexiShield Gel Case is made from a non-slip material and is currently up on Olixar’s website in clear, black and blue variants. 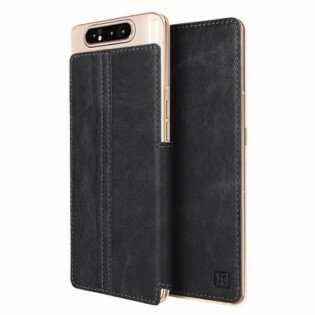 The price is a mere $6.99 – a welcome sight compared to Galaxy Fold cases. For more info on the Galaxy A80 and our initial impressions, you can head over to the hands-on review.